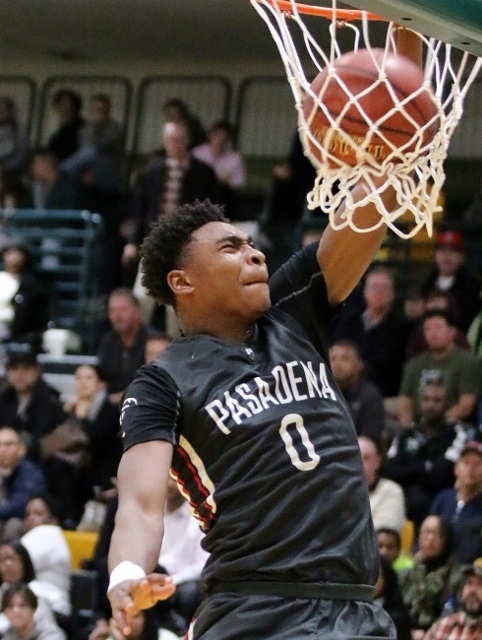 Bryce Hamilton and the Pasadena Bulldogs will face Chino Hills in the Division 1 Finals Saturday night. (Photo by Duane Barker). Pasadena vs. Chino Hills: Azusa Pacific University – 8:30 p.m.
Duarte vs. Da Vinci Design Academy: Colony H.S. – 10:00 a.m.
Nogales vs. Foothill Technology: Azusa Pacific University – 10:00 a.m.
La Puente vs. Santa Clarita Christian: Colony H.S. – 2:00 p.m.
Bishop Amat vs. Notre Dame/Riverside: Azusa Pacific University – 6:00 p.m.
Glendora (30-0) vs. Downey: Azusa Pacific University – 8:00 p.m.
3 Comments to "CIF Basketball Playoff Pairings: Finals"
All games will be on Fox sports prep zone. Open division finals only will be on FS West or prime ticket. Chino Hills vs. Pasadena is a GREAT matchup. APU is also a wonderful venue for this game. Really looking forward to this one.